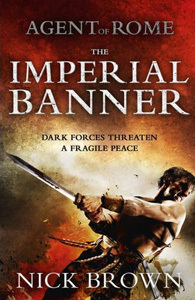 The Roman Emperor Aurelian has defeated Queen Zenobia and crushed the Palmyran revolt, but now dark forces threaten a fragile peace. Faridun’s Banner, hallowed battle standard of the Persian Empire, has fallen into Roman hands and is to be returned to the Persians as part of a crucial peace treaty. But on the eve of the signing the banner is stolen. Recalled to Syria, imperial agent Cassius Corbulo is charged with recovering the flag. Accompanied by his faithful servant Simo and ex-gladiator bodyguard Indavara, Cassius must journey across the dangerous Syrian desert to the equally perilous streets of Antioch. He and his companions face ruthless brigands, mysterious cults, merciless assassins and intrigue at every turn. The hunt is on! “A Roman James Bond … an abundance of intrigue and clever counter-moves.” (de Telegraaf, Holland).